LG’s latest flagship smartphone offers NFC, a 13MP camera that records HD video at 120fps, and “knock code” unlocking. The LG G Pro 2 is an Android 4.4 smartphone that offers a 5.9-inch Full HD IPS display powered by a 2.26GHz quad-core Qualcomm Snapdragon 800 with 3GB of RAM. The Knock Code feature makes unlocking and using the G Pro 2 easier and more convenient than ever, says LG, allowing users to power on and unlock their phone by tapping the screen using one of 86,367 knock combinations. 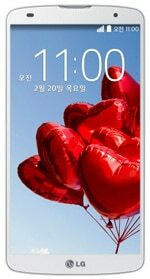 The device was announced in Korea on 13 February 2014, and is available in black, white and silver.